Managed Software Center is a utility that we use in order to provide a number of services to Bowdoin-issued laptops and student machines. The primary role of Managed Software Center is to provide self-service installation of some software without the need for IT intervention as well as to ensure that computers are current, patched and up-to-date. Managed Software Center for students and personal faculty and staff computers can be downloaded from IT's website. In order to download the software, a valid Bowdoin username and password are required. Follow The Instructions: Be sure to follow the instructions on the download page. If you do not, the name of the downloaded file will be a randomly generated name and might not be easily identifiable on your computer system. Restart Required: A restart will be required once the installation is complete so be sure to save all of your data and close all applications before continuing. MacOS / OS X usually unzips the files once downloaded. If this has not happened, simply double-click the downloaded file to expand it. Accept all of the defaults and restart the computer when complete. The lists of software available do differ based on your role at the college. Students are offered more basic applications such as Firefox and Chrome, some applications that we offer to students as part of out campus agreements such as Microsoft Office, free applications that we bundle together for specific courses and all of the PolarPrint drivers. On personal computers, faculty and staff will also see all of the above options. On Bowdoin-issued computers, faculty and staff will see all of the above as well as additional productivity or course work applications that are licensed specifically for use on campus. 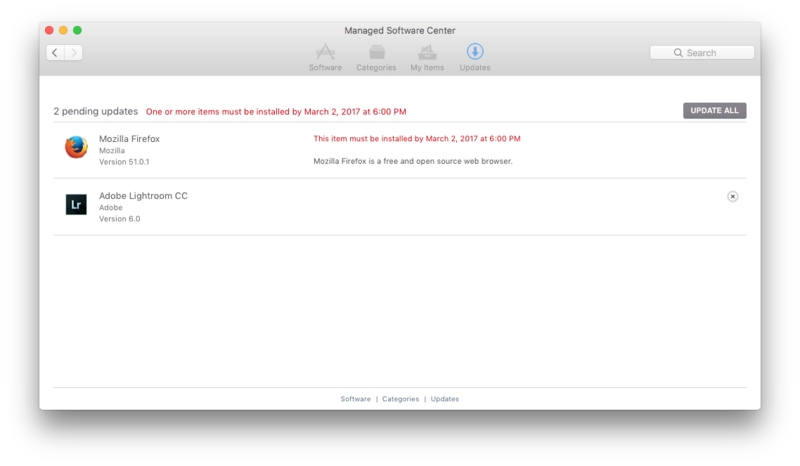 To install software through Managed Software Center, launch the application which is located in your Applications folder*. From inside of the application click on the Software icon. Scroll through the list and locate the application you want to install. Once located, click on the Install button next to the application name. If there is no Install button but there's a Remove button instead, Managed Software Center believes you already have the application installed. Once you click on Install, the software will download to your machine. NOTE: It has not yet been installed! Click on the Updates icon in the menu bar across the top of the window. From here you will see a list of all of the software and updates that are ready to be installed. Click Update or Update All to begin the installation. If for any reason you have conflicting applications open, you will be notified and given an opportunity to close the application. For example, if you were trying to update Microsoft Word and it is open, you will be asked to close Word before you can continue. In some cases, especially in the case with OS updates, you may be required to log out or restart after the installation has begun. Again, the software will warn you and will not do it without your acknowledgement. * If you do not find Managed Software Center in your Applications folder, contact the Service Desk at x. 3030 or the Student Service Desk at x. 5050 for assistance in locating or installing the service. Managed Software Center also provides you with a way to ensure that you are always up to date with the latest software versions and patches from Apple and from many of the major third-party applications like Microsoft Office, Firefox, Chrome, etc.. When updates or patches are available you will see them when Managed Software Center runs. You can choose to delay their install however major patches are enforced and must be installed within 30 days of our approval. If not installed manually, the software will force the installation on the due date. To install patches manually, simply click the Update button when the window below appears. Patches are released periodically and IT staff work to ensure that patches will work before they are approved. It is possible that a patch will become available by other means before they are approved in Managed Software Center. If you feel you would like to upgrade or patch in a different manner you are free to do so with no harm to the system. Check out this knowledge base article I found in the Bowdoin College knowledge base. 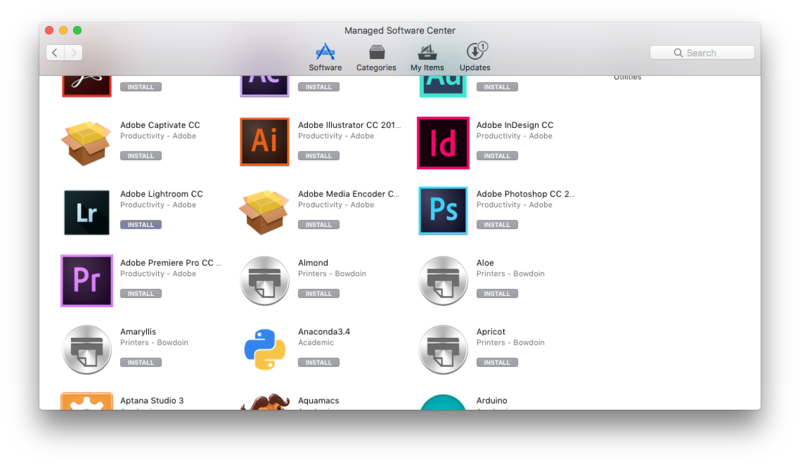 https://bowdoin.teamdynamix.com/TDClient/KB/ArticleDet?ID=24189 Managed Software Center for MacOS: How to install and use Managed Software Center is a utility that Information Technology uses to provide a number of software-related services to Bowdoin-issued Apple laptops and student machines. One key benefit of Managed Software Center is to provide self-service software installation without needing to request assistance from IT.